The Urban ultra-poor pilot program started in 2010, has reached 200 households in 13 slums and will soon scale up dramatically. It is a two-year pilot program that builds on the enormous success of BRAC’s globally emulated 10-year-old ultra-poor program, which focuses on rural areas. The first thing to understand about targeting slum-dwellers is that they are all migrants. According to Rabeya Yasmin, director of BRAC’s ultra-poor program, about 90 percent of rural to city migrants settle in the slums. Permanence is a major issue. Most slum-dwellers live illegally. They are squatters with no rights and only the most tenuous grip on life. Eviction is an ever-present possibility, upsetting the lives of the poor and often throwing a wrench into BRAC’s hard work. In the targeted slums, beneficiaries never own land. They generally pay rent to a “muscle man”. The muscle men of the slums were a recurring theme. Even essential tasks like building clean toilets requires the musclemen’s approval. Sanitation (or lack there of) is one of the most critical issues in tackling slum poverty and a major contributor to health problems. The sense of impermanence even extends to government policy. Since the government encourages relocation out of the slums, government services generally don’t reach slum-dwellers. Child labor is a big problem in the slums. A simple truth about child labor is that if the parents make money, children don’t work. Therefore, every parent that BRAC is able to place into an income generating activity, means that their children aren’t likely to work and therefore more likely to attend school. As with the rural ultra-poor program, the initial phase of the urban TUP is beneficiary selection. The community approach to participant selection that BRAC takes in the rural ultra-poor program doesn’t work in slum settings, since the “community” is much less likely to have adequate knowledge, familiarity and cohesion to credibly select the truly ultra-poor. Instead, BRAC adapts the selection process for the slum setting. BRAC developed a special questionnaire targeted to the urban poor to identify beneficiaries, and also conducts focus group discussions. After the survey and focus group discussions, senior managers verify the results of the selection process. After participant selection, enterprise selection is the next critical step. Enterprises are selected according to member priorities. The selected enterprise must be familiar to the local environment as this ensures that there is enough knowledge in the community to help support the enterprise and sufficient experience to assess likely demand. Some of the businesses common in the slum include: sari business, mobile fruit stand, fabric and tea stall. As with BRAC’s rural ultra-poor, BRAC offers an asset transfer feature in the Urban TUP program. BRAC transfers 6,000 taka (or about $80) worth of assets. Asset transfers include 2 and 3 wheel vans to cart heavy goods and metals – eg for a mobile tea stall (pot, sugar, cups). It’s amazing what a two or three wheel cart can do to kick-start a business. One woman I met started a tea business, with BRAC’s help. With the asset transfer and training BRAC provided, she was able to increase her income from a daily 100 taka (about $1.25) working as a day laborer to 400 taka (about $5). To support the participants’ livelihoods, similar to the rural ultra-poor program, BRAC offers financial services (savings and soft loans for certain participants) as well as a monthly stipend. We had the opportunity to visit with a slum poverty reduction committee, a critical component of the Urban TUP program. As adapted from the original rural ultra-poor program, the committee consisted of three village elites (including landlord), a community health volunteer (Shasthya Shebika in BRAC parlance) and members of the urban ultra-poor program. When I asked the elite members of the group, why they participated in the committee, the answer was very simple – giving back. They felt it was important to support the poor members of their community. Training is a critical part of BRAC’s ultra-poor program, including modules on life skills, enterprise development and health. Though there are many similarities in the training program offered in the urban, program, there are some differences. For example, the urban program offers training in safe road crossing. Seems like an odd choice. Unless of course you have actually tried to cross a road in Dhaka. “Where can I sign up?” I wondered. The health module includes training on water borne disease prevention and treatment, vitamin A, deworming training and use of water purification tablets. The water purification tablets are an all-too rare example of a market solution for people in poverty. The tablets are readily available in the market and are cost effective even for the ultra-poor. In addition to training, BRAC provides financial support for healthcare, including arranging and covering costs of medications and lab tests. We observed one heartwarming beneficiary of BRAC’s financial support. While we were visiting a new tea business, we encountered a little girl, perhaps no more than 4, wearing a thick pair of glasses. As Shabiha explained, BRAC staff learned that the girl was severely handicapped and her vision was significantly impaired. 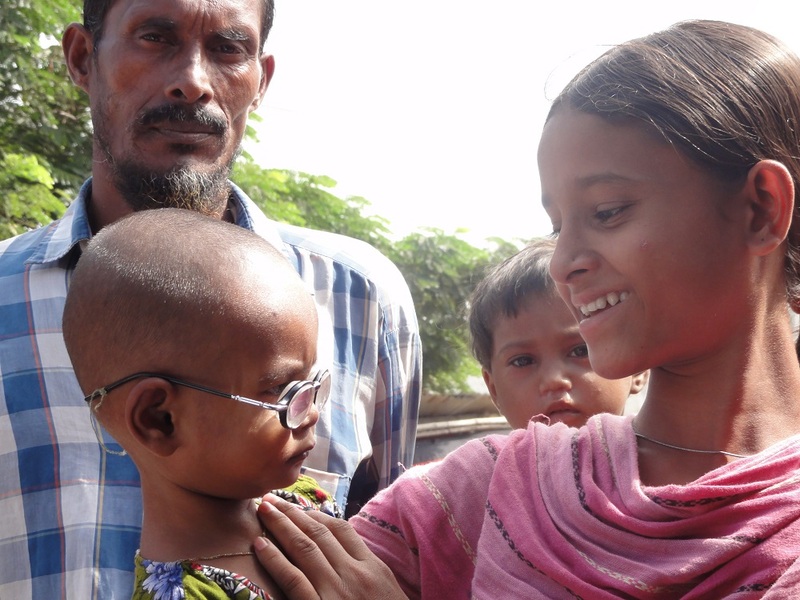 BRAC arranged for and paid for the glasses as part of the healthcare support component of the program. While this may seem like a handout on the surface, in the context of a holistic program designed to make the most of the opportunity those glasses provide, those glasses are a microcosm for the urban ultra-poor program as a catalyst for a brighter future. Just came across this interesting article. My Rotary Club is planning a programme for the ultra-poor in the slums of Lagos, Nigeria. What parameters do you use in selecting the beneficiaries. You mentioned a questionnaire, but you did not give details of the questions. The template for selection, and indices to measure success at the end of the programme will be of help to us.